The outdoor season is in full swing, so the garden is quickly becoming an outdoor living room. Whether you have had building work on your property or simply want to completely redesign your garden, good planning is a basic requirement for a green paradise. The new GARDENA My Garden garden planner makes the creative design of your garden easier than ever. The free online planner is easy enough for anyone to use. The menu contains everything you need to draw your plot with areas such as grass, beds and paving. You can also add items like houses, plants, furniture etc. Save your plans and make changes again and again. Use the link to easily share garden plans with family, friends or other gardening service providers. The built-in sprinkler system planners can be used to quickly and easily choose the perfect irrigation solution. 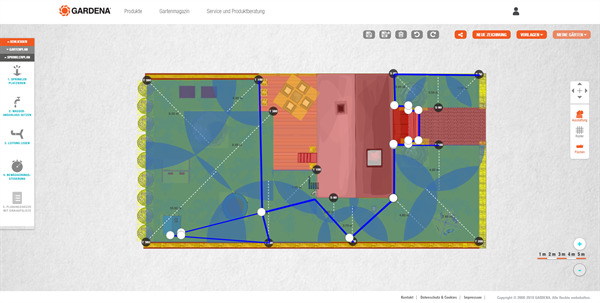 The sprinkler planner can be added after your garden design is complete. In just five easy steps, you will receive a unique planning sketch with sprinkler and piping diagram as well as a downloadable shopping list with all the products you will need. GARDENA My Garden is a free web application based on the latest browser technology which allows you to visualise, save and share individual garden plans. The garden planner is optimised for the use on a tablet, laptop or PC. Your saved garden plans can be accessed via your smartphone. More information can be found on the GARDENA website at www.gardena.com/mygarden.